A few posts back I promised to post about how I study. First I have to mention that I absolutely love to study. Not only art, but a wide variety of topics from A to Z. There are so many fascinating things to learn about. I have always thought that it would be wonderful to be paid a salary to just be a student for the rest of my life. I suppose in a way I am paid a salary, it just isn't in the traditional form of pay. The upside to that is that it isn't taxed! I love this shelf that my mate made for me as I can reach any book I need without getting up. As you can see, there is a number of art books on the left. Just a small selection from the total. There are also books on sewing, herbs, music, and cello playing. These are what I am currently referring to. There are also a few Plein Air Magazines tucked in there. I learn something from each and everyone. I always pick up new information whenever I re-read them too. I also have several videos. I like videos but, by necessity, they tend to be a bit more limited in scope than books. Of course, if you have read my previous posts, you probably realize that I do a lot of practical studies. About 99% of them are plein air. 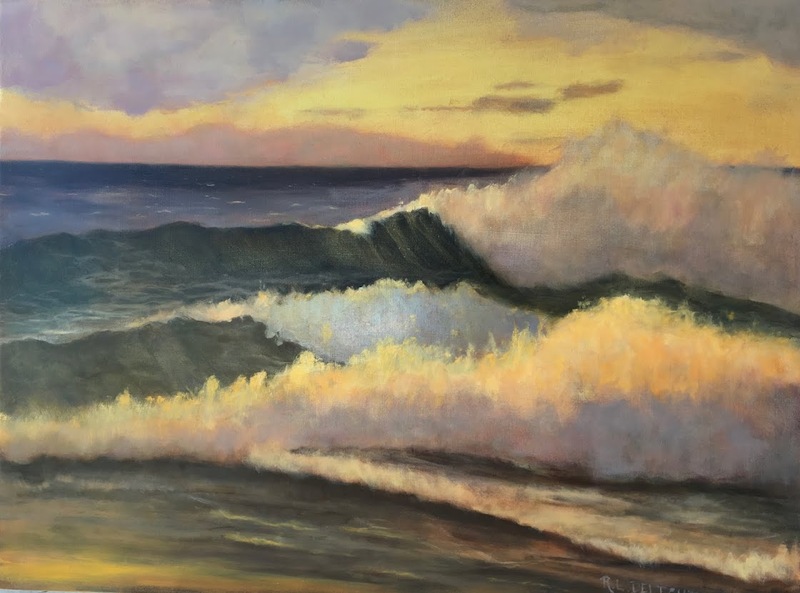 I have painted close to 300 in the past two years with 82 of them being wave studies. When I first started painting en plein air, I realized I was going to have to paint a lot and that many of them wouldn't be that great. I don't have a lot of extra funds so I tried to find ways to save money and still accomplish my goals. After a bit of research and crunching some numbers I decided to use canvas pads. The one on the right is mostly what I have used. The 12"x16" has been perfect. I can get 4-6"x8" canvas per sheet, or 40 per pad. I think it came to about $1.60 a painting. I didn't feel so bad if I messed up. Plus, I wasn't going to be tempted to sell my study if I got a good one. Since I don't use reference photos, these are the only reference material I have, along with any sketches. After I cut the canvas to the size I want, I tape it with white artist's tape to hardboard panels I cut for that purpose. When I am finished, I remove the tape and pin it up on my bulletin board. When I fill the board up, I take them down and it is ready for a new batch. I am down to my last 6 or so cut and taped canvases to use. After the cotton ones are gone I have the Centurion linen canvas pad to use. The canvas is a lot nicer and I am thinking I want to mount the sheets to panels first so they will be more permanent. I am still thinking on that one. I decided that when all of this is used up, which will be fairly soon, I will graduate to Centurion pre-mounted linen panels. They are fairly reasonable in price and I want to start painting more with an occasional finished plein air painting in mind vs. a study. I will continue to upgrade my panels as I can afford to. Here is my bulletin board just recently, before clearing it. It is on its way to being filled up again. All of this is materials and resources so far. I also do practical studies with paint, pencil, and other mediums. These are value scales I put together to help me with paint values. I used Color-Aid paper, glued them to cardboard and coated them with acrylic gloss medium. I have been working on my values lately and am starting to see progress. Here are a few samples I painted using an artist's painting that I admire as value reference. I worked to match the range of values in the painting and gained quite a bit of understanding from the exercise. Finally, I have a couple of online classes that help keep me accountable yet give me time to go at my own pace. The biggest and best by far is Sadie Valerie's Online Atelier. This gets me back to my roots of highly disciplined and structured academic art study. I have only done the introductory exercise and had it critiqued. Sunny days to paint and life's concerns have slowed me down but I am determined to continue. Michelangelo is reputed to have spent an hour a day drawing. If it is good enough for Michelangelo, it is even more so for me! Here is my first submission. It took 5 hours and is graphite on paper. I know, not terribly exciting is it? It was done without a model, just in imagination. My next assignment is to draw ellipses (done), an outlines exercise (nearly done), and another value sphere like above. The point is to see improvement. Once it is critiqued and Sadie gives the green light, you move to the next exercise. It is progressive with one skill building on the previous skills. I will post these in their own posts in the future. This is a long post. It covers a lot but not quite everything I do. So now, when you graciously notice the improvement in my work, you will know that it really has nothing to do with "talent" but just determination, hard work, willingness to fail, the wonderful artist people who surround me, and a pinch of good fortune thrown in. I would love to hear what other people do to study, no matter what the medium or skill. Please feel free to post a comment!